Now ya’ll know I eschew buying anything plastic…I will go to great lengths to buy in glass, buy in bulk, make it myself..whatever it takes to not contribute to the plastics industry. BUT, last year my sister gifted me with something called a Chillow. the company called it a “comfort pad”. IT ROCKS! Yes, it really works.. She had gotten it because she was going through menopause and it was kickin’ her tail. I on the other hand am not bothered by them but hate running the air conditioning. I live in Florida and we are experiencing 100 degree days.Last summer we had a few days that got to 105. 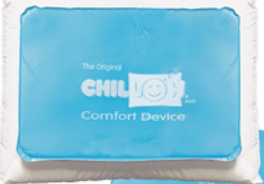 So I use the Chillow and it works! It a plastic pillow with a side that feels kinda like flannel. the water you fill it with is slowly drawn to the surface and cools you.